An unforeseen scheduling conflict involving a Hilo concert and a motorsports race has been resolved, with the concert promoters graciously agreeing with the County to an alternate venue, the Hawai’i County Department of Parks and Recreation announced Thursday. 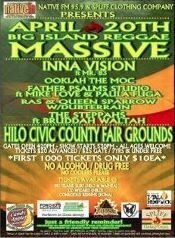 The Big Island Massive Reggae concert and voter-awareness event will be held April 20 within the fairgrounds area outside the Afook-Chinen Civic Auditorium. Concert promoters David and Majila Murray of SCC Productions agreed to shift venues to avoid impacting the Big Island Auto Club’s April 21-22 Points Meet drag races that serve as a fundraiser for the Food Basket. SCC Productions and the BIAC had reserved the Hilo Drag Strip on consecutive days, which raised concerns that post-concert cleanup work could delay the start of the popular drag races. Buddy Loeffler, a member of the BIAC’s Board of Directors, said he’d like to thank concert promoters David and Majila for their willingness to move their concert to the Hilo civic and the Department of Parks and Recreation for quickly initiating efforts that produced an acceptable solution. The Department of Parks and Recreation also commends the BIAC and SCC Productions for working collaboratively in resolving the scheduling conflict so both events can occur at our public facilities in Hilo.